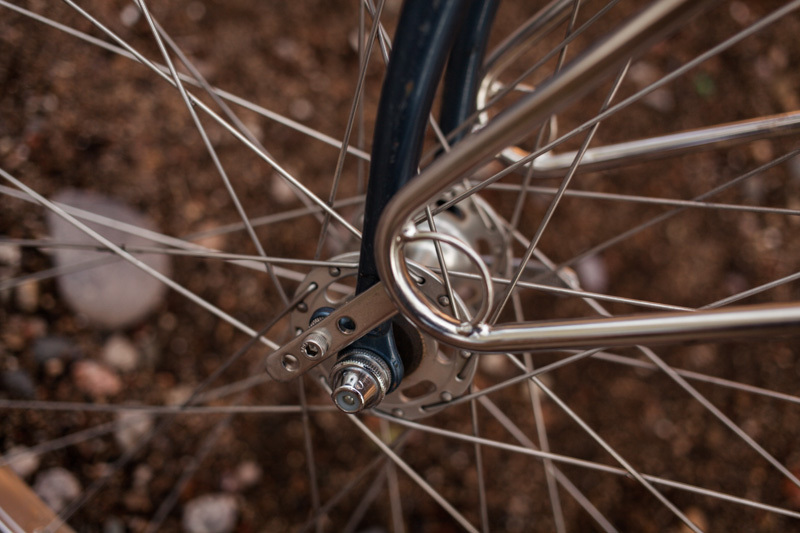 Recently, I blogged about a $1500 hub – my coveted Rohloff Speedhub. At the opposite end of the pricing spectrum, this post revolves around a humble bike that cost me the grand total of two hundred one dollar bills (and if truth be told, I’d happily set off on a Latin American tour with it, if that was all I had). Old Man, as my ’84 Stumpjumper is affectionately known, lives outside in the yard. I know, relentless days of New Mexican sunshine aren’t kind to its tyres or vintage Ideale saddle. But Old Man’s a free spirit, and keeping him behind closed doors doesn’t seem right. And besides, the casita I live in is already filled to the gils with baby bits, with barely room to swing a bicycle frame. So right now, Old Man resides behind the house (unlocked, but you don’t know where I live, do you), my go-to bike for nipping down to the nearby co-op, or riding to the library. Depending on my mood, I run two differing sets of tyres. The ballon-like Schwalbe Super Motos he came with are perfect for barreling around town, while the cheap and knobbly CSTs, leftover from our Great Divide ride, urge me to rekinde its dirt road roots. But this review isn’t about the bike. It’s what it’s been treated to: a rather lovely, stainless steel, Velo Orange Porteur front rack. At $160, I’m very much aware that its value is close to what I paid for Old Man himself. But it was the most graceful, off-the-peg option I could find, and somehow seemed a fitting gift for his semi-retirement. 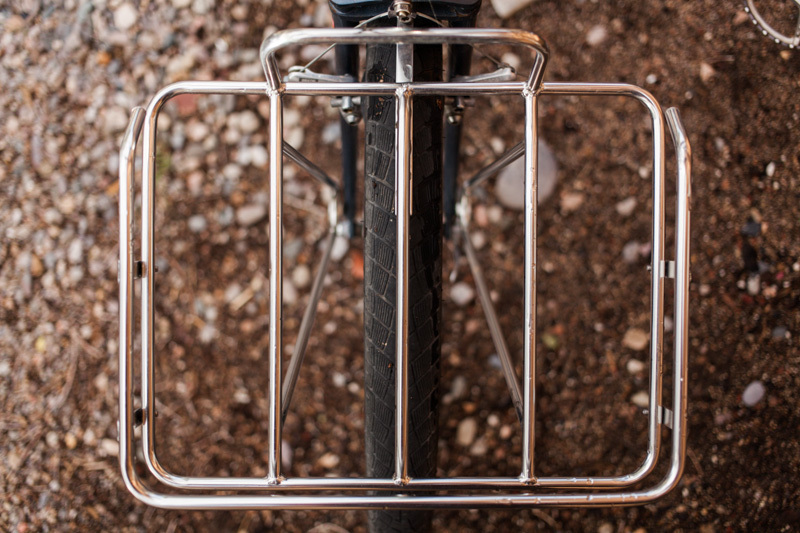 Velo Orange’s Porteur rack. Very pretty indeed. 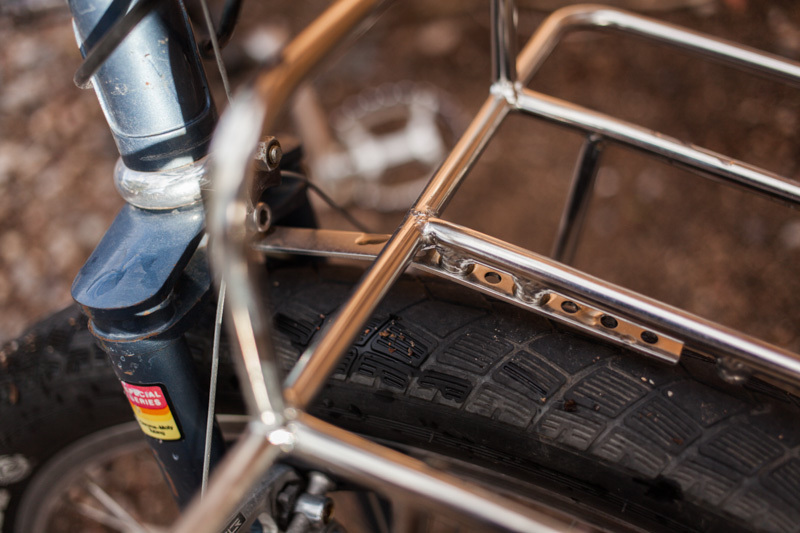 Plus, the Porteur’s rail is easily removed, for a flat bed option. Extra large pizza, maybe? For now, a net bungee works perfectly. A purpose built ‘porteur bag‘ would no doubt be especially stylish. My original intention was remove the rails and zip tie a Wald basket onto the Porteur, or better still, invest in one of Swift Industries’ or Inside Line Equipment’s lovely bags. But for now, I just use a cardboard box, bungeying it into place when need be. And for errands down to the local shops, or delivering a parcel to the post office, the Porteur has proved ideal. Without doubt, there’s a very pleasing aesthetic to a front rack loaded with produce; and it’s always nice not to wear a backpack, especially given the summer heat. But I have to be honest. As pretty as it is, this isn’t a rack I’d take away on a long and bumpy bike tour. And although it handles moderate loads just fine, it’s not one that I’d pile high with tomes of the Encyclopedia Britannica – its three point fitting doesn’t feel quite rigid enough. If you have braze-ons on the crown of your fork, I’d recommend looking into customising the Porteur with one of Surly’s rack hardware kits, giving it four-point stability. This might well be the solution to my woes. I should add too that significant weight up front makes an already squirrely bike – early Stumpjumpers were made that way – even more so. However, it’s nothing so bad I can’t just chalk down to character. To help, I could probably have tilted the rack back a touch, bringing the load closer to the steering axis, and shortening the mounting strut for a little extra rigidity too. But I’ve a thing about running racks parallel to the ground: it bugs me if they’re not. When it comes to looks, I can’t complain. This rack gets no end of admiring comments from cycling enthusiasts and non bike nerds alike. The finish has held up extremely well to a few months of elemental onslaughts, from searing summer heat to monsoonal storms, and remains as polished as the day I received it. As you might expect of a rack commanding such a price, it comes ready with all the nuts, bolts and gubbins you’ll need to fit it to your bike securely, without scuffing any paintwork. 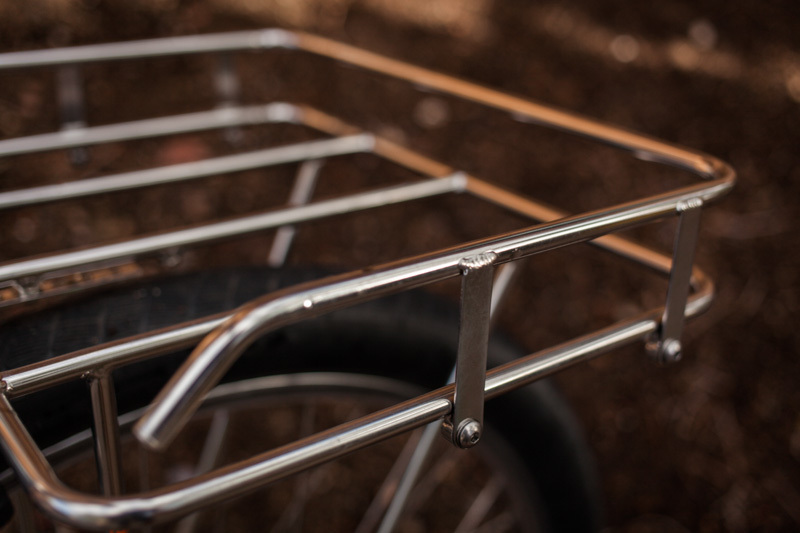 There are more details on the VO site – but basically, the platform of the Porteur rack is around 36cm x 29cm. Total weight, including all the mounting hardware, is a little over 1kg – a figure a set of kitchen scales didn’t dispute. 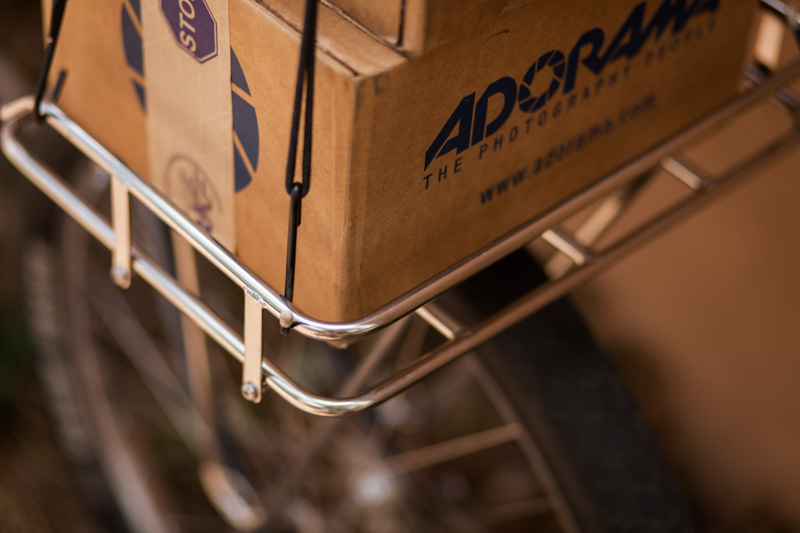 The cheaper Constructeur front rack ($95) looks like it would tote a basket nicely. Matching it with a Constructeur rear rack ($85) would be particularly indulgent. UK readers may not be familiar with US-based Velo Orange, creators and distributors of a wealth of bicycle parts that might otherwise be awkward to find, or lost in the annals of time. Their styling borrows heavily from French Constucteur bikes of the mid 20th Century. VO make some interesting, affordable frames too. The impending Camargue – the larger sizes come in a 29er flavour and clearances for 2.3in tyres – has definitely piqued my interest. Their blog is well worth checking out. This entry was posted in Gear and tagged Porteur rack, Specialized Stumpjumper, Velo Orange on September 12, 2013 by Cass Gilbert. Cass — excellent review. Just the same reasons that I love my porteur rack. And, if you ever get the urge for the ILE bag, drop me a line. I have a spare that I’m looking to part with, amicably. Thanks Steve. I’ll certainly bear that in mind, though I’m not expecting to be reunited with Old Man for a while. That’s a nice harem of bikes you have there! Hey, thanks. And the harem continues to grow: I’ve got a Troll waiting in the wings that I’m pretty stoked about. I’ve had a series of front racks on my commuter and almost bought the Velo Orange rack for the last upgrade. I opted for a Surly front rack with a large Wald basket wired onto it. 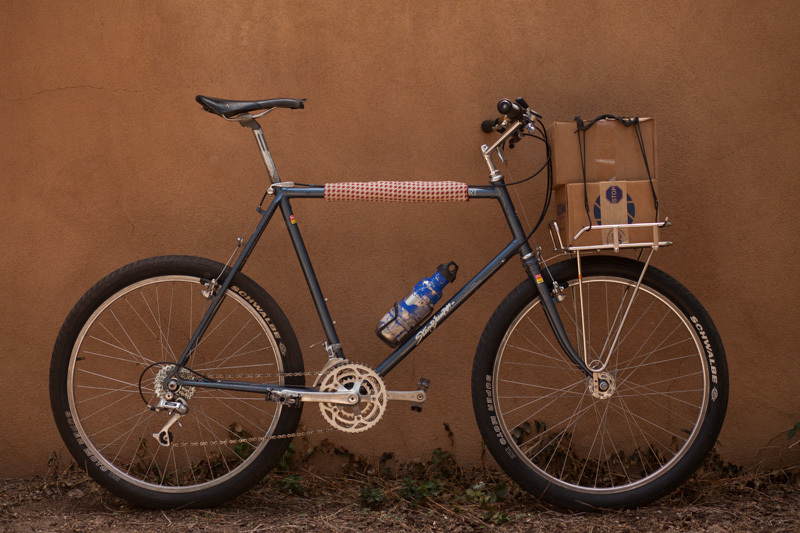 The VO is prettier but the Surly will carry a case of beer easily or a 40# bag of dogfood without too much trouble. First time comment, long time lurker… Great site! You make me jealous on a daily basis 😉 That Stumpy is fantastic! It looks right at home with a porteur rack and those Super Moto’s. How do you like the super slack geo? I’ve got an 84 Fisher Mt. Tam with similar geo and it’s a trip to ride…. Thanks Jeff. As much as I love the Stumpjumper, I have to admit, the handling is a little on the noodly side, especially climbing out of the saddle. Goes down mountains very nicely though! Owning a very relevant piece of biking history is a real treat too. I couldn’t agree more! Keep up the great work Cass!! Are you still out there? How are you healing? Yes, I am still alive! Unfortunately, recovery has taken a lot longer than I was hoping, and I ended up in a lot of pain – perhaps the cause of a torn muscle and trapped nerve. But the good news is that as of the last couple of days, I’m finally feeling a lot better – and preparing to get back on the road. It’s humbling to get hurt; I now feel all the more appreciative to be able to travel by bike. Can’t wait! Hi Cass, Scott of Porcelain Rocket told me to check out your site, glad I did. Great pictures, writing, and most of all, places. Just one note, reraking the fork to 65mm would help with handling with a load up front. Did it on my cruiser, that I use to go shopping, with two wald baskets on the front rack. Thanks for the tip Emanuel. I’ll look into it.